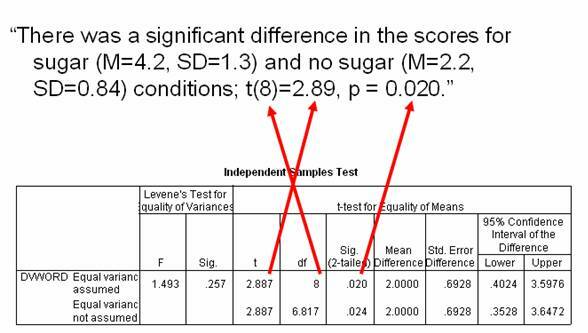 Home > How do I report independent samples T-test data in APA style? It’s a good idea to report three main things in an APA style results section when it comes to t-tests. Doing so will help your reader more fully understand your results. Now we’ll finish up by filling in the values related to the T-Test. Here we enter the degrees of freedom (df), the t-value (t), and the Sig. 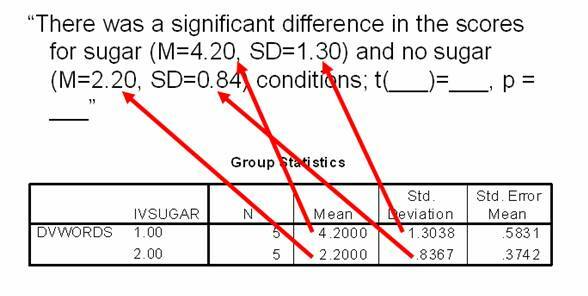 (2-tailed) value (often referred to as the p value). You have to admit, the previous sentence is pretty intimidating. It might be hard for someone to figure out what that sentence means or how it relates to your experiment. That’s why it’s a good idea to report you results in an easy to understand language, after you have stated them scientifically. Imagine that you were trying to explain these results to a family member or friend who does not know much about science. This sentence is so much easier to understand than the one will all of the numbers in it. Looks pretty good huh? This isn’t so hard after all.